Healthcare costs and rising drug prices are topics of intense debate. In recent elections, many candidates focused their platforms on healthcare reform, and the current administration has proposed new legislation for drug price transparency. As a result, payers are factoring this legislative uncertainty into their decisions for coverage and patients are seeing increased premiums, deductibles, and out-of-pocket pharmacy costs. Payers continue to bear a heavy share of the burden of drug costs, and their success rests on their ability to manage the budgets of employer sponsors. Payers will continue to try various utilization management approaches including narrowing formularies, contracting with manufacturers for preferred therapies, shifting risk to providers, value-based contracting, and tightening prior authorization criteria. While these methods make sense in theory, they can be difficult to implement in practice due to healthcare market dynamics and significant technological requirements. For instance, when payers attempted to share more costs with patients through co-insurance and tiered out-of-pocket requirements, pharmaceutical manufacturers responded with patient copay assistance programs to encourage patient adherence. In today’s ever-changing market landscape, payers are open to innovative options that streamline utilization management and improve cost-effectiveness. Due to the challenges with traditional mechanisms for payer cost management, payers and pharmacy benefit managers (PBMs) creatively introduced copay accumulator and copay maximizer programs for their commercially insured populations. Both copay accumulator and copay maximizer programs are positioned to have a substantial impact on the way in which prescription drug costs are distributed across key stakeholders. Copay accumulator programs are a new component of benefit designs offered by many payers and PBMs for commercially insured patients. These programs are also known as “accumulator adjustment” or “variable copay” programs and were originally intended for qualified deductible plans that require the employee to pay their deductible without assistance from the drug manufacturer. Accumulator programs track utilization of manufacturer-sponsored copay assistance to ensure that manufacturer contribution no longer counts toward a patient’s deductible. This ensures that qualified high-deductible health plans (HDHPs) with health savings accounts (HSAs) governed by federal law maintain their legality as the patient cannot receive financial assistance for the deductible with these plans. 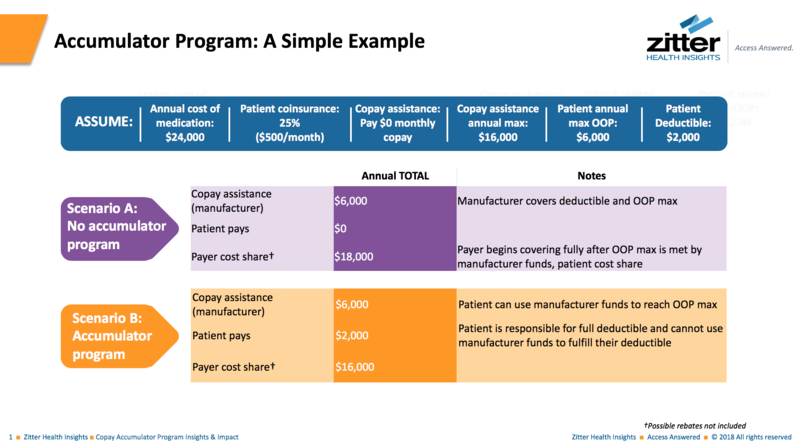 Without a copay accumulator program (Scenario A), the patient pays $0 and the manufacturer covers the cost-share up to the out-of-pocket maximum ($6,000), which leaves the payer with $18,000 in annual total cost share. With a copay accumulator program (Scenario B), the patient contribution climbs to $2,000 to cover their full deductible. Think of copay accumulator programs as a rule that enforces the patient’s full payment of the deductible without subsidization from the manufacturer’s program toward the cost of the drug. It is important to note that although the manufacturer copay assistance funds cannot be used toward the patient’s deductible, they can sometimes be used toward the total cost of the drug to reach the patient’s out-of-pocket maximum obligations depending upon the plan design. While these programs do provide cost savings for payers and employers, other benefit design strategies have pushed savings even further. Copay maximizers evolved from copay accumulator programs as another new type of benefit design for commercially insured patients. Typically pitched by PBMs to help payers and employers access the benefits of manufacturers’ copay assistance programs, these programs maximize the manufacturer’s copay assistance fund allocation. 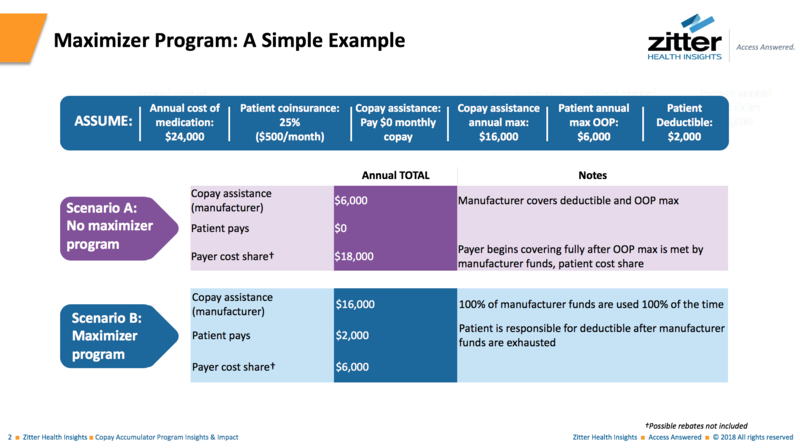 In some plan designs, the total amount of a manufacturer’s copay assistance program can be divided by 12 months to become the new monthly copayment for all patients on the drug but, in most circumstances, the maximizer depletes the manufacturer funds up front before patient and payer contributions even begin. Copay maximizers are designed to ensure that 100% of a drug’s copay offset program is used for 100% of patients on the drug even if it is not evenly dispersed throughout the year. 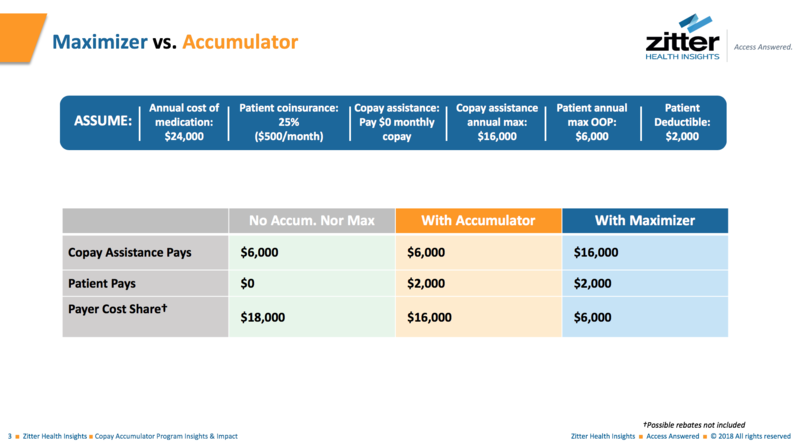 In a scenario without a copay maximizer program with the same assumptions as in Figure 1, the payer cost share would be the same $18,000 with a patient contribution of $0. In a scenario with a copay maximizer program implemented, the copay assistance spikes to $16,000, exhausting the manufacturer’s maximum benefit, and resulting in a $2,000 cost share for the patient. The payer cost share decreases to $6,000 since the payer is only required to cover the remaining annual cost of the drug (Figure 2). That is a $12,000 annual savings for the payer for this one example patient. With potential individual prescription costs reaching six figures annually, it is clear how attractive this is for payers as a cost-shifting method despite its complexity. Understanding maximizers and accumulators is critical to manufacturers (see Figure 3) given that both benefit designs will impact brand budgets and could affect patient adherence. According to ConnectiveRx, a leader in copay affordability programs, copay offset programs are utilized to offset patient out-of-pocket costs on average 38% of the time for specialty brand prescriptions and 15% of the time across retail brands. Thus, brand teams have allocated budget to fund these programs accordingly. In the case of a maximizer program, 100% of patients taking the drug and enrolled in the maximizer benefit design would max out 100% of the full benefit amount offered. With all enrolled patients utilizing their maximum allocation of copay assistance program funds, the total amount of annual budget dedicated to a manufacturer’s copay assistance program could be drained in just months. Zitter Health Insights data shows that nearly 60% of commercial lives are covered by payers who have copay accumulator or maximizer program benefit designs available. With a majority of lives covered by plans with accumulator or maximizer programs, pharmaceutical revenues will likely be affected in addition to budgetary shortfalls. Self-insured employers, payers, and PBMs need to improve cost predictability for their plan sponsors to maintain their competitive advantage. Self-insured plan sponsors are pushing payers to control costs and reinforce their benefit design, motivating payers to implement copay accumulator and copay maximizer programs. Payers and plan sponsors want to put pressure on manufacturers to reduce drug prices however they can, and these programs can accomplish that goal. As a pharmaceutical executive, you need to understand what these programs are and how they will affect your business. Zitter Health Insights research shows 41 million lives are already in a benefit design that includes a copay accumulator program and an additional nine million are in a copay maximizer benefit design. It is critical for you to get ahead of the curve and prepare for the impact of copay accumulator and maximizer benefit designs on your brands and budget.